Raise your hand if you've ever been stuck with a dead cell phone and no charger for it within a 10-mile radius. Okay, chances are you've never been in such a situation, but in case you were, we know what could have helped you get your handset up and running – a solar-powered charger with a convenient USB output. 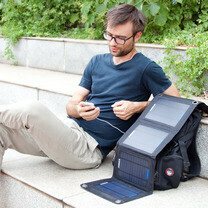 Yes, solar-powered chargers for smartphones and tablets exist and come in a broad range of sizes. In the slideshow below, you'll find 10 such chargers, made to provide the vital 5 volts of USB output at any place illuminated by the sun's rays. In addition to all the power banks, cases, and chargers, Anker has a couple of solar-powered chargers in its accessory portfolio. The smaller one is rated at 8 watts and can provide 1 amp at 5 volts through its USB port, while the larger, 14-watt one should reach up to 2 amps of output under optimal conditions. The Solargorilla is what you need if you plan on conquering a mountain or traversing through a desert. It is a rugged, water-resistant solar charger that outputs 5 or 20 volts for charging smartphones, tablets, cameras, even laptops. But it doesn't come cheap. For less demanding tasks, Power Traveller has a smaller and significantly cheaper model, the Solarmonkey Adventurer. Unlike the Solargorilla, the Solarmonkey includes a 2500mAh battery and doubles as a power bank. Its USB port's output, however, is relatively weak at 0.7 amps. The three mono-crystalline solar panels on the Instapark Mercury 10 produce a total of, you guessed it, 10 watts of power. When there's sufficient sunlight, of course. The two USB outputs produce up to 2 amps of combined current and can recharge two devices at the same time. The Enerplex Kickr is a flexible, foldable, weather-resistant, super-durable, and lightweight solar charger with a 6-watt power output under ideal conditions. This translates to the respectable 1.2 amps of charging current under ideal conditions. Smaller and cheaper models are available as well, but produce lower output currents and will need longer to recharge your gadgets. Suntactics has a range of durable, weather-resistant solar chargers, the smaller of which is the sCharger-5. It outputs 1 amp under normal conditions, which is okay for charging pretty much any phone at a steady pace. For those demanding more power, there are also the sCharger-8 and sCharger-14, producing 1.6 and 2.8 amps of current respectively. Solartactics's products are made in the USA and come with a 5-year warranty. GoalZero's solar panels come in multiple sizes, the smallest of which, the Nomad 7, generates 7 watts at either 5 or 12 volts. The two larger models produce 13 and 20 watts respectively when illuminated by bright sunlight, but come at a steeper price. All Nomad chargers can be combined with a GoalZero power bank to store power for those times when Mr Sun isn't around. The Waka Waka Power+ is remarkable in that it combines a highly-efficient (22% efficiency) solar cell with a 2200mAh rechargable battery. It can be used as a power bank, as a solar charger, and as a flashlight thanks to the built-in LEDs with up to 75 lumens of output. And for every Waka Waka product you buy, Waka Waka will donate one to the world's people with no access to electricity. Poweradd is offering a broad range of small and large solar panels with USB outputs. One of them is this 14W dual-port panel with combined output of up to 2 amps. XD Design has a variety of solar-powered phone chargers in its catalog, including the cute Suntree, which uses 9 solar cells to harness energy from the Sun. The juice is stored in a built-in, 1350mAh battery, or fed directly into the device plugged in. Portable models of various sizes are also available for purchase. And last but not least, we have this highly-portable, flexible solar panel from Bushnell. While there's no device plugged into its USB output, energy is stored inside of a built-in battery for later use. I would probably buy a powerbank and charge it from one of these and never use my mains again. The guy in the thumbnail looks so casual, just sitting their with his solar charging backpack.